LAS VEGAS -- A little glitz and a sampling of a Las Vegas Strip dance and acrobatic performance marked the arrival of the first direct commercial airline flight from mainland China to Las Vegas. 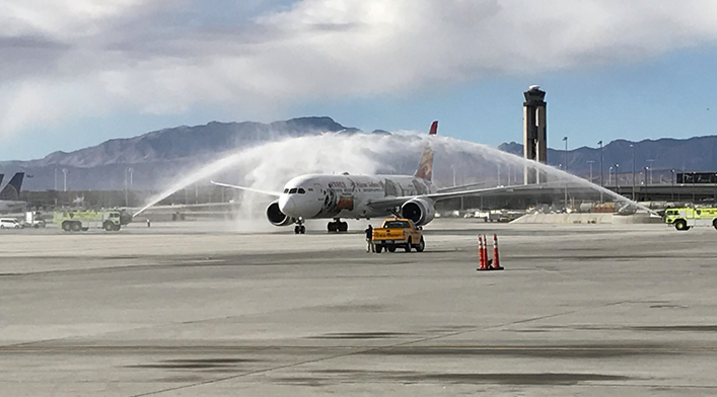 Area elected and tourism officials, a Hainan Airlines executive, and Luo Linquan, the consul general of the People’s Republic of China in San Francisco, attended a Friday ceremony welcoming the start of scheduled passenger service between Las Vegas and Beijing. The three-times-a-week flights through McCarran International Airport take 13 hours going west and 12 hours going east on Boeing 787 Dreamliner aircraft. Direct passenger air service comes as casino companies court Chinese nationals and Chinese-Americans on and off the Las Vegas Strip. A performance by the cast of KÀ by Cirque du Soleil was part of the festivities.